At slightly less than two inches long, triplefin fish don’t seem like much of a threat. But as new research shows, these aquatic carnivores have a rare organ that turns their eyes into veritable flashlights—an ability they can switch on when needed. Dolphins and bats use a form of active sensing called echolocation, whereby reflected sound is used to pinpoint the location of an object. Photolocation, in which reflected light is used to probe the environment, also exists among animals, but it’s exceptionally rare. Until now, only three known examples existed among vertebrates: deep-sea dragonfishes, lanternfishes, and flashlight fishes. These animals perform this trick using built-in chemiluminescent “searchlights”—a specialized light organ located next to the pupil. As sunlight trickles down from above, these light organs reflect the light in a sideways direction, improving vision under low light. Thing is, these fish don’t have any control over this effect; it’s kind of a neat “side effect” produced (and likely enhanced) by the powers of evolution. Triplefin grow to about two to three inches long, and they can be found from the East-Atlantic Ocean through to the West-Mediterranean sea. They like rocky coastal areas between between depths of 16 feet and 65 feet, and can sometimes be found as deep as 165 feet (50 meters)—depths at which low light starts to become an issue. Triplefins sit relatively motionless most of the time while looking around at their exceptionally bland, monotone marine environment. Every once in a while, a triplefin will make a quick and short “hop” to a new location. When potential prey is spotted—typically small crustaceans and copepods—the tiny carnivores will inch forward ever so slightly before making a quick killing strike. While stalking its prey, the eyes of triplefins sometimes alternate between red and blue, a trick the fish accomplishes by rotating and tilting its eyes. Prior to the new study, marine biologists speculated that triplefins used the light emanating from their eyes as a means of photolocation. The new research, led by Nico Michiels, was an effort to test whether this radiance is actually switched on by the fish. 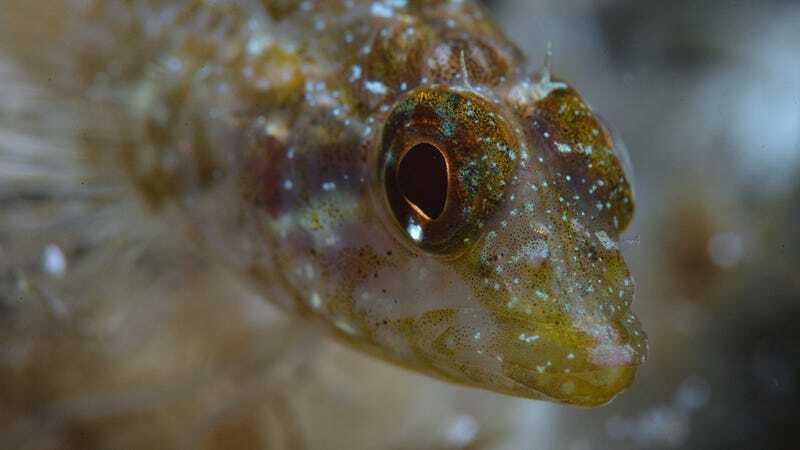 To that end, Michiels’ team focused on the triplefin’s “ocular sparks”—a bright spot on the iris just below the pupil produced by the fish’s protruding spherical lens. Small eye movements allow the fish to flick the feature “on” or “off” in an instant, which suggests the light-redirecting property is not a side effect, but a deliberate action. The eyes can glow either blue or red, which presented an experimental opportunity for the scientists who wanted to figure out if the frequency of the sparks and their hue were dependent on the background color, and if they changed in the presence of potential prey. In the first experiment (performed in tanks at a Tuebingen University lab), the scientists saw that blue sparks fired more frequently against red backgrounds, particularly when small prey were present (i.e. copepods), and vice versa. These complementary combinations worked to maximize the contrast between the light reflected onto the prey and the background. The fish were able to light up an area about two inches (5 cm) in front of them. In the second experiment, the scientists tested the fish to see if their eyes sparked up more frequently when they were hungry, which turned out not to be the case. “We conclude that iris radiance through ocular sparks in T. delaisi is not a side effect of eye movement, but adaptively modulated in response to the context under which prey are detected,” conclude the researchers in the study. But while the behavior is directed, the scientists aren’t sure if it’s actually helping the fish to catch their prey. “This ‘detection component’ of active photolocation is subject to ongoing experiments and visual modelling,” write the researchers. Regardless, this is a super cool finding, one which shows how much we still have to learn about the wiles and guiles of the animal kingdom.